I t defies the imagination, the story that Tommy Hodges is sharing. "That's right. From the 1950s through the 1960s and 1970s and into the 1980s, this Alcoa plant was one of the largest aluminum smelters in the world. In our prime, the complex em- ployed more than 2,400 people and produced a pound of aluminum every 11 seconds," he says. 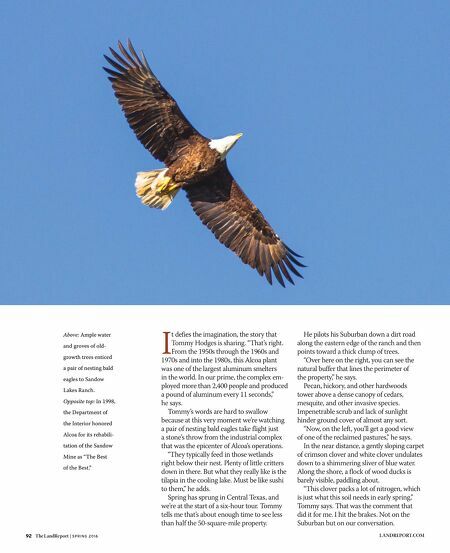 Tommy's words are hard to swallow because at this very moment we're watching a pair of nesting bald eagles take flight just a stone's throw from the industrial complex that was the epicenter of Alcoa's operations. "They typically feed in those wetlands right below their nest. Plenty of little critters down in there. But what they really like is the tilapia in the cooling lake. Must be like sushi to them," he adds. Spring has sprung in Central Texas, and we're at the start of a six-hour tour. Tommy tells me that's about enough time to see less than half the 50-square-mile property. He pilots his Suburban down a dirt road along the eastern edge of the ranch and then points toward a thick clump of trees. "Over here on the right, you can see the natural buffer that lines the perimeter of the property," he says. Pecan, hickory, and other hardwoods tower above a dense canopy of cedars, mesquite, and other invasive species. Impenetrable scrub and lack of sunlight hinder ground cover of almost any sort. "Now, on the left, you'll get a good view of one of the reclaimed pastures," he says. In the near distance, a gently sloping carpet of crimson clover and white clover undulates down to a shimmering sliver of blue water. Along the shore, a flock of wood ducks is barely visible, paddling about. "This clover packs a lot of nitrogen, which is just what this soil needs in early spring," Tommy says. That was the comment that did it for me. I hit the brakes. Not on the Suburban but on our conversation. 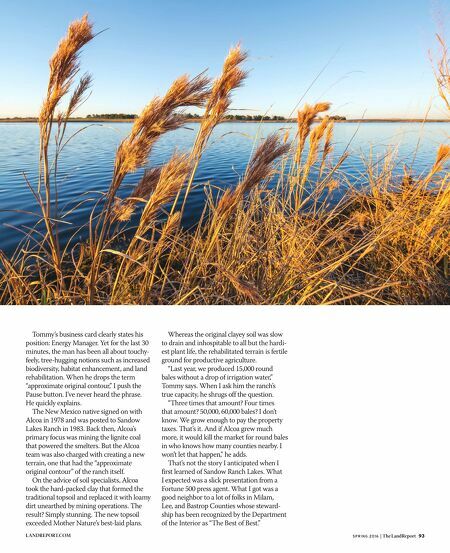 92 The LandReport | S P R I N G 2 0 1 6 LANDREPORT.COM Above: Ample water and groves of old- growth trees enticed a pair of nesting bald eagles to Sandow Lakes Ranch. Opposite top: In 1998, the Department of the Interior honored Alcoa for its rehabili- tation of the Sandow Mine as "The Best of the Best."